As we continue our journey into the asylums of long ago, I feel compelled to speak a bit about the state of mental health care today. De-institutionalization was enacted by President Ronald Regan in the 1980s, releasing many patients who were functional yet still had the need for more assistance in the outside world. This assistance did not come easily and in some cases, never came at all. The conditions in many of these hospitals were awful and the treatments barbaric–and yet to many of the patients, it was far more frightening when they were turned out of the only home they ever knew. The system is far from being perfect, even in today’s modern age. The mentally ill continue to face much ignorance-based prejudice and state hospitals are still crowded and understaffed. We’ve changed the language to make it all sound better when the first step should have been to actually work to make it better. With that being said, let’s go back to a time when the issues that defined insanity are known today as ‘epilepsy’, ‘menopause’, ‘premenstrual syndrome’ (yes fellas..there was a time you could get your wife committed for going nutty on ya at ‘that time of the month’), and a host of other conditions that today would seem..well..insane to think of institutionalizing someone over. 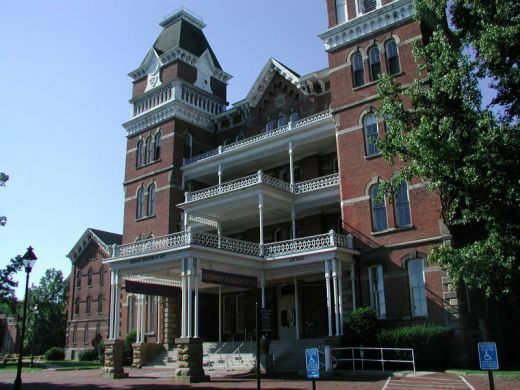 It was during this time that the Athens Lunatic Asylum was constructed in Athens County, Ohio. The building was designed in the standardization of the Kirkbride Plan. While it is very easy to believe that the attitudes of yesteryear were uniformly backwards, there were many who took the first steps to better the treatment and care of the mentally ill. Thomas Story Kirkbride was a pioneer for advocacy of mental health and he believed that for patients to benefit from treatment, they deserved to have comfort and privacy. These institutions were Victorian in design, with an imposing outward appearance, yet the interior was designed to give each patient their own space with plenty of sunlight and activity. Sadly, these asylums, or state hospitals as they later became known, were often overcrowded with patients suffering neglect and going through horrific treatments that are now considered harmful and outdated. Athens was no exception. The years of operation were from 1874 until 1993, with many patients suffering the harsh experiments that at the time were thought to be breakthrough treatments in mental illness. One such treatment was the lobotomy, also known as a leucotomy. This procedure was attempted as early as the 1880’s, however it was fully developed by Antonio Egas Moniz, a neurologist from Portugal in the 1930’s. The surgery involved cutting into the connections to and from the topmost part of the frontal lobes in the brain. This was used as a treatment for certain behaviors that seemed psychotic or dangerous. The lobotomy was performed many times at Athens, and some patients were left with the inability to do much of anything while others retained their intellect but still suffered lifelong physical and mental effects. Other treatments that were considered the norm and routinely practiced at Athens were electroshock therapy (shock treatments) and hydrotherapy (water treatments). The lists of causes for mental illnesses at the turn of the century and into the early 1900’s were almost laughable by today’s standards. It was thought that excessive masturbation was the cause of most males mental defects and menopause or menstrual difficulties was the cause for most females. Later investigations into the facility showed that many of the staff at Athens were not fully trained to carry out their jobs and some had no training whatsoever. One of the most interesting and often told stories I have come across when looking through information on Athens is the tale of an ill-fated woman who some believe has never left. According to the story, in December of 1978, a patient by the name of Margaret Schilling wandered into an abandoned section of the hospital and was not found for over a month. There are some discrepancies in the accounts given–one site states that the Athens Messenger ran the story about her disappearance with a call to help on January 12, 1979. However, another stated that this is the date her body was found. Some say a custodian found her, others say that it was a group of people. Athens went by many names, but the facility itself remained much the same…an overcrowded, underfunded building with many of the patients not suffering from true mental illnesses for the most part, but rather very treatable conditions. The hospital housed everyone from the criminally insane to people with epilepsy and alcoholism. They all walked the same halls and shared the same conditions. Years have passed since the last patient left Athens, and it has since become property of Ohio University, with the main office building now housing the Kennedy Art Museum. Other buildings and cottages on the grounds have either been restored or have been left alone due to asbestos risks. Their stories are forever emblazoned in the remaining buildings with walls that contain many secret horrors that will likely never be told–in this realm anyway. I heard recently that if your husband was just tired of you that he could have you committed for no real good reason at all.